Doomsday, Prophecy & Red Robin laugh at their captor from within their prisons. Mr Oz is shocked and angry to hear that one of those prisoners has escaped. A blue light engulfs the sky as the hooded man investigates Red Robin's mocking claim and discovers it to be true. Within the huge prison cell is graffiti carved into the walls related to Superman. Over in Hamilton County, Clark and his family are still enjoying their evening when the doorbell rings. Jon goes to investigate and finds a family album on the doorstep and sees Other Clark standing in the shadows. Krypto goes to investigate and reacts angrily to Other Clark. 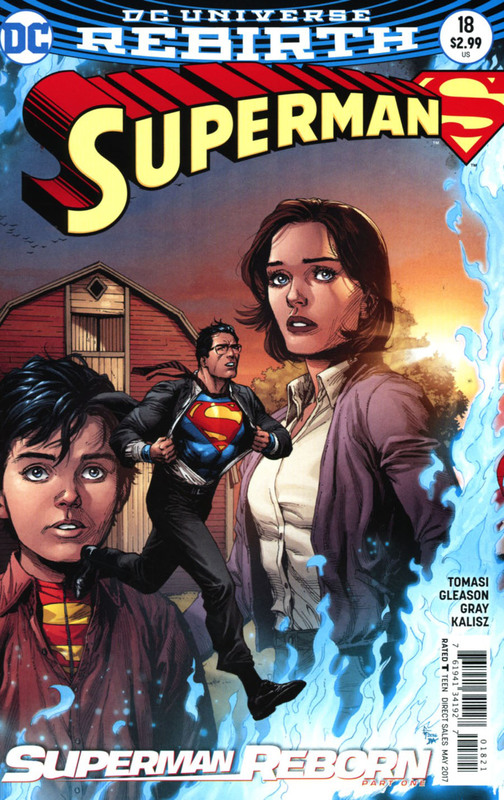 Lois and Superman race to help but Other Clark has vanished. They flip through the family album and see their life play out exactly as they remember it. Suddenly their farm is ablaze, not with fire but a strange white fire disintegrating everything in its path, including Jon. Superman flies through the farmhouse and discovers Jon fading in and out of existence. He pulls Jon out of the house and he and Lois are heartbroken to see Jon disappear for good. The album content has also been erased as Lois and Clark break down in tears. Superman finds one final photo - of Metropolis and swears to make Other Clark return their son to them... or else. Story - 5: Other Clark is unhinged and his revenge plot is a cruel one. I'm not seeing it from his side at all, he feels Clark has stolen his life, his wife and family but he never had it, right? As the story escalates I'm starting to wonder more than ever who Other Clark really is. The threads leading up to this have been neatly building; the creation of two Superwomen, the birth of New Super-Man and Lex taking on the mantle too, all spinning out of New 52 and the death of Superman on this Earth. Of course Convergence altered several events and then added to the mix the events of Multiplicity, and the meeting with Swamp Thing all add more to the mystery. We know from spoiler news sites what the outcome will be but WHO it will be is a mystery and I am looking forward to seeing how this all plays out. The race to save Jon was incredibly sad as both Jon and his parents new he was about to be erased. The mystery still outweighs the story but it builds fantastic anticipation in the reader. I can't wait to see what happens when the two Clark Kents finally face off and motives are revealed. Art - 5: As the realization kicks in that everything they hold dear is being wiped out, Gleason and Gray do a stellar job squeezing every emotion out of you. In fact the rush of emotions really was like a rollercoaster. The team did a great job with the layouts and, considering the ghost story last issue, getting back to the regular team was a welcome return. Cover Art - 4: A tad on the cheesy side but considering the outcome of the issue it makes everything far more emotional than I would ever have thought. I would have preferred a more immersive background compared to a flat gradient. Variant Cover Art - 5: A beautiful yet heartbreaking variant with Clark racing to save his family before it is lost to him forever. 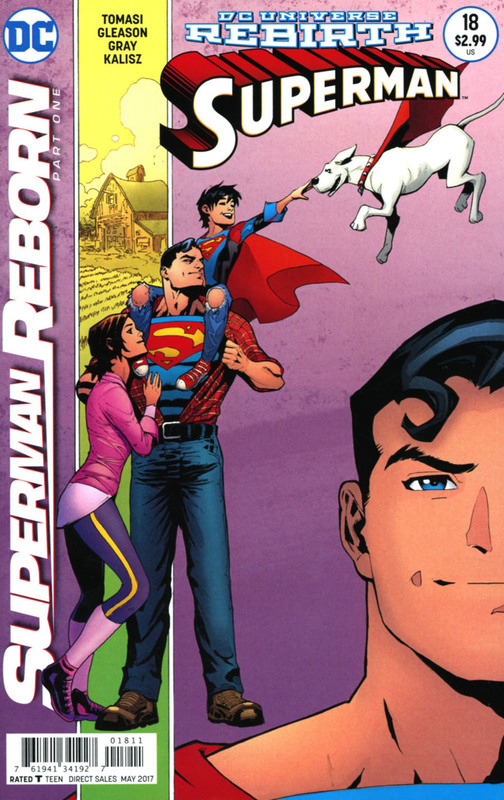 I really hope Lois and Jon make it through to see Superman Reborn to fruition.